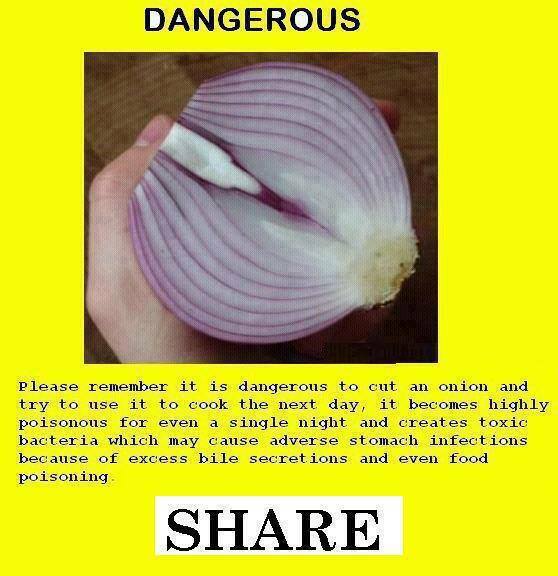 Do onions become toxic or otherwise dangerous within a day of a being cut open? Aside from the terrible grammar and punctuation, the claims at a glance seem largely ridiculous--cooking would kill any bacteria, for example. Is there any truth to the claim that an onion becomes dangerous, specifically for cooking (as opposed to eating it raw) within a day of being cut open? Q: Are cut onions or leftover onions poisonous? A: When handled properly, cut onions are not poisonous. After being cut, onions can be stored in the refrigerator in a sealed container for up to 7 days. A widely circulated claim states uncooked, leftover onions are 'poisonous' because they're 'a huge magnet for bacteria,' thus likely to spoilage. This claim stems from a blog post that dates back to March 2008. While the original post was removed from the internet in 2009, part of that post continues to circulate the internet. Not the answer you're looking for? Browse other questions tagged nutrition safety toxicology cooking . Are there any toxic or dangerous food pairings?